The term volcano originated in the name Vulcan, the Roman god of fire. A volcano forms if there is a rupture or natural occurring opening in the Earth’s crust that allows melted rock called magma, volcanic ash, and gases to escape from under the surface. Many people think of conical mountains with lava flowing down its sides once the term volcano comes to mind. However, this is only one of various types of volcanoes that exist. Composite or strato volcanoes form between alternating layers of lava and stone fragments and they form into various kinds of shapes such as large conical, concave, pyramidal, convex-concave, helmet-shaped, collapsed, nested, elongated, and even a few with numerous summits. Shield volcanoes consist almost entirely of lava stream. Broad horizontal layers of lava form sheets that cool down, with subsequent eruptions accumulating additional sheets over ones previously made. These kinds of volcanoes are large in area but have a low profile, which resembles a warrior’s shield. A complex or compound volcano is a volcano with more than one feature. This kind of volcano is the least predictive as it might change the way it erupts or its consistency. It may have more than one vent with each vent erupting differently. Some volcanoes form beneath glaciers while other volcanoes grow well below the surface of the ocean. A submarine volcano is one that starts beneath the surface of a body of water, typically in an ocean. 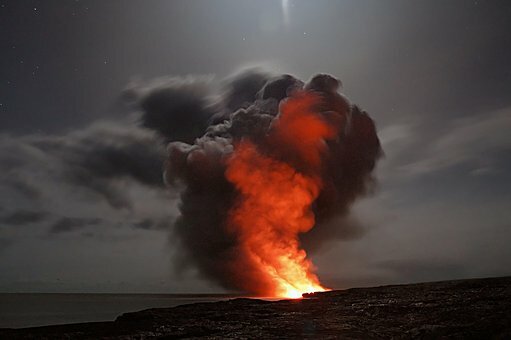 When submarine volcano builds substantially such that it projects above the ocean’s surface, it creates an island or a small chain of islands, like the Hawaiian Islands. There’s a major set of active submarine volcanoes in the Pacific Ocean called the Ring of Fire. Its’ horseshoe-shaped ring extends to about 25,000 miles. It consists of more than 450 active and dormant volcanoes, which represents over 75 percent of the planet’s volcanoes. While lots of people associate destruction and harm when they think of volcanoes, in addition, there are some benefits of volcanoes that people have learned to capitalize on. One of the chief benefits of a volcano is its rich volcanic soil. Submarine volcanoes form habitable islands in various places with unique characteristics. Besides being habitable, the Hawaiian Islands are in a strategic military position serving as a gateway between North America and Asia. There are particular gems and construction materials that just come from the deposits left by volcanoes. Tuff is a hardened volcanic ash that is a lightweight durable material used in concrete. Regions of volcanoes produce large quantities of geothermal energy, like areas including Iceland and Costa Rica. The thermal energy is usable to produce energy and natural spas. The Arenal Volcano in Costa Rica is a beautiful and marvelous natural wonder to see. It’s one of the ten most active volcanoes in the world since it emits ash and lava on a regular basis. This large symmetrical volcano stands 5,437 feet that formed from multiple layers of lava, rock, and ash. After 400 years of dormancy, the Arenal Volcano became active and normal beginning in 1968.